It’s becoming an annual thing. 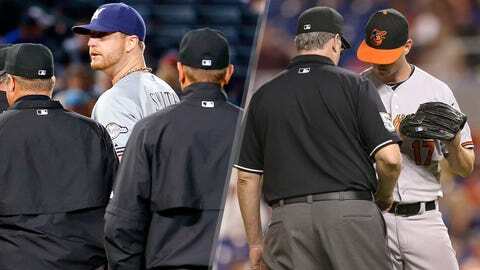 Last week, Will Smith and Brian Matusz were ejected and suspended for applying foreign substances to the ball (really, for being found with foreign substances on their bodies while on the mound), touching off what’s fast becoming a hopelessly convoluted conversation. * Every pitcher in the league, or some astoundingly high percentage of them, uses foreign substances on the baseball. * Most of them use it primarily for the grip, to reliably get the action they expect on the ball, not to doctor the ball into some air dance that stretches the limits of physics. * Because of the relatively lax enforcement of the rules prohibiting use of these substances, it’s become an open secret among teams. Only when the violation goes beyond evident and into the realm of blatant is it considered couth to ask an umpire to inspect an opposing pitcher. * Batters want pitchers to use what they need to grip the ball well, within reason, the better to protect against errant pitches shattering the ear flaps of their batting helmets. * The rule against substances has become such a farce as to pass out of utility, and MLB should simply rewrite the rules to permit a broader spectrum of grip enhancers for pitchers. I might be sensing more unanimity than there is on this issue, but it sure feels like that concluding bullet matches the general sentiment. (An informal Twitter poll brought me five votes in favor of relaxing or abolishing foreign-substance rules and just one in favor of maintaining them.) Given the ubiquity of the practice, people are reticent to vilify players for breaking the rules that regulate it. That’s great. We should certainly avoid undue castigation. Using pine tar, sunscreen or another illegal substance to grip the ball does not make a player a black-hearted cheater. Nor does scuffing or cutting the ball make a pitcher a bad guy. Whatever he can get away with, he need not feel shame for trying. The culture of American sports permits competitors to cheat. (We should talk about whether that’s a good thing, I guess. But not today.) The legitimacy of a game doesn’t hinge on everyone playing by the rules. It does, however, hinge on everyone being held to the rules as closely as logistics and fairness allow. That’s where those who want to wash their hands of this problem lose me. If reasonable steps aren’t taken to make sure rules are enforced, the game gets worse. Scandal erupts. Players get unfair, uneven treatment from the media. Teams look for the right chances to create an advantage. Unnecessary drama builds, centered not on the game, but on the childish code of conduct that governs those who play it. My objections to letting foreign substances go run deeper, though. For one thing, the fact that hitters support the right of pitchers to use them is as misleading as it is backward. Hitters have teammates to protect. It wouldn’t go over that well on one side of a clubhouse if the other spent its time bemoaning the use of foreign substances, so hitters give the quote their pitchers will appreciate, because they don’t realize what’s really going on. And that’s the second thing: I can’t believe hitters can’t see what’s really going on. It’s grating, the smugness with which pitchers dismiss the use of these substances as ways to get a better grip. They’re just trying to get a surer grip on their breaking ball, and to avoid letting a fastball fly a little too early, beaning a guy. It’s for the hitter’s own good, you see. No one wants a guy who can’t get a grip throwing 95 at them. You know something? If a pitcher can’t get a grip, he ain’t throwing 95. If he can’t properly grip a breaking ball, he’s going to stick to his fastball. Finger strength, touch, manipulation of the hand itself throughout a delivery: These are skills that separate good pitchers from bad ones. They’re part of the art of pitching, and if a pitcher can’t achieve that without using a grip aid, that’s a failing we deserve to see on display. Getting a grip isn’t just getting a grip, is what I’m saying. Pitchers want you to think it is, and many people are lapping that up, but getting an unnaturally comfortable grip allows pitchers to do unnatural things, things that exceed their real talent level, both in terms of raw stuff and in terms of command. It’s a difference of degree, not a difference of kind, but it’s still a difference. Every time a pitcher takes the mound, be it the first inning or the ninth, the home-plate umpire should walk to the mound as the ball goes around the horn after the final warmup toss. He should do a cursory inspection of the pitcher, checking his glove, his arms, the bill of his cap. I’m not talking about frisking anyone, but a thorough visual check should take place every half-inning. And if the umpire sees something suspicious, he should follow up on it. Just as is the case now, any pitcher found with an illegal substance on the mound, or any teammate caught aiding the pitcher in applying such a substance to the ball, should be immediately ejected and suspended. By the way, hold your outrage about the suspension for doctoring the ball being longer than that for throwing at a batter or punching someone during a brawl. This overlooks an obvious, crucial difference in the kind of violation involved: The extracurricular stuff is extracurricular. It’s shameful and stupid and often dangerous, but it doesn’t imperil the competitive integrity of the game on the field even a little. That gives players a bit of a shield from discipline. When the game itself is the victim of an infraction, suspensions get longer. So it is that corked bats draw the same penalty foreign substances do. So it is that performance-enhancing drugs draw a longer one, and so it is that betting on baseball draws the longest one possible. Again, cheating is part of the United States’ sporting culture. It’s not a defect of personal character to flout the rules. It’s a defect of institutional character to ignore them, or to selectively enforce them. Pitchers don’t need pine tar and sunscreen on the ball in order to pitch well, and if they do, they don’t deserve to pitch well. We need a stronger enforcement system for the rules in place to stop them from using those substances, not a way around the rules that everyone can simply feel better about. Matthew Trueblood is an author of Baseball Prospectus.